From a fine J.P. White, early 20th century, Arts and Crafts cast. It was originally paired with K012 Bacchus. An example can be seen in the Hampton Court Palace garden. From a fine J.P. White, Arts and Crafts, early 20th century cast. It originally was paired with K011 Rose Girl. A simple but elegant tiered fountain. Copy of a group “Boy with Swan”, the original fountain cast by Geiss, circa 1850. The artist was Professor Kalide (1801-1864) of Berlin. Commissioned for the King of Prussia. The group was a feature to be seen at the Great Exhibition at the Crystal Palace. An example can be seen in the Italian Garden, Osborne House, Isle of Wight. A copy of a mid-19th century figure. As a directional fountain it is suitable for poolside use or as a centrepiece. Often used unpiped for garden ornament. A copy of a fine 19th century garden sculpture. As a directional fountain it is suitable for poolside use or as a centrepiece. Thought to have originated from the eminent Arts and Crafts movement’s Bromsgrove Guild of Applied Arts’ lead sculpture foundry. As a directional fountain it is suitable for poolside use or as a centrepiece. A copy of Verrocchio’s (15th Century Italian sculptor) “Boy with Fish” sculpture, the original fountain can be seen at the Palazzo Vecchio, Florence. All Verrocchio’s sculptures have good movement from every direction viewed. After Verrocchio’s (1435-1488) sculpture of the infant Hercules. As a directional fountain it is suitable for both poolside and centrepiece use. A feature that all Verrocchio’s sculptures have in common, is they have great movement from every direction viewed. Taken from an antique, well-sculptured, 18th century, Venetian fountainhead. Copied from a classic 19th century Handyside of Derbyshire fountain group. The classic lead fountain taken from a 19th century model by the famous Coalbrookdale Foundry, Yorkshire. Copied from an 18th century English lead sculpture. This makes a fine central water feature. Faithful copies taken from originals that dates to mid 19th century. From French artisans at the A. Durenne company, a leading 19th century foundry famous for large decorative casts. A copy taken from a stylish 19th century fountain. Makes a fine central water feature, particularly if associated near aquatic plants. Taken from 19th century patterns. The boy and dolphin fountain head feed the shell to form a directional cascade. Suitable for poolside use or as a centrepiece. This tiered fountain combination is a faithful copy of Verrocchio’s “Boy with Pike”, set in a deeply scalloped round shell, surmounting three boldly sculptured dolphins. Taken from a late 18th/early 19th century, Austin and Seeley cast, this large fountain has proportions of good scale. A copy of the 15th century, Italian sculptor, Verrocchio’s best known work, surmounting three, well-modelled dolphins from a 19th century design. The “Boy with Fish” original can be seen at the Palazzo Vecchio, Florence. All of Verrocchio’s sculptures have good movement from every direction viewed. This model dates from the mid 19th century, taken from a cast by the famous Coalbrookdale Foundry, Yorkshire. The supporting swans of the K042 fountain are completely interchangeable if preferred to the dolphins. This model dates from the mid-19th century, taken from a cast by the famous Coalbrookdale Foundry, Yorkshire. The supporting Dolphins of K041 fountain are completely interchangeable if preferred to the swans. The two pipes can be directed into a tiered cistern or pool. They are suspended by an unseen, attached, single round copper dowel for ease of mounting to a wall. A single copper water inlet pipe is further divided into two smaller copper pipes supplying the two fountain heads. The design dates from the 19th century. This combination of the three models (K043, K044, K045) in this water feature, illustrates the versatility of design with lead. The deeply scalloped clam shell has many uses. This item is heavy and requires support underneath if raised. Copied from an 18th century antique lead casting, this dolphin support has the distinctive Venetian Rococo styling. Decorative adaptation by the company of a 19th century Viennese drinking fountain. Decorative, complete cistern–fountain combination, based on an antique garden water feature. This style of fountain is a very straightforward design solution where a fountain is desired. A copy taken from a fine 19th century casting. A dowel can be fitted to the back for wall mounting. This tiered fountain is suitable as a centrepiece for a smaller pool. Taken from a 19th century lead casting. A good sized water feature, the Satyr taken from a very fine antique French casting. Water wells up into the broad, deeply scalloped shell, providing a cascading style, making this fountain suitable for side or centre use. Typical Arts & Crafts design, copied from an early 20th century model. Multiples of this stylised lead frog provide a very flexible fountain head. A group of four is illustrated as an example. Made individually. There is a smaller version available, A167, 12.75cm (5in) high x 17.75cm (7in) wide. 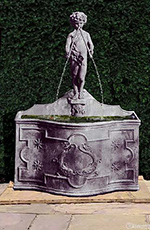 Copy of a bold Arts and Crafts, early 20th century fountain, the design allows for flexible use. The stylised fish is supplied with a 12.5cm (½in) copper pipe, but can be specially modified to take a larger pipe. The Toad (K054) was the original companion figure to this, presumably to go either end of a pool. A copy of Brussels’ most famous fountain. Copy of a bold Arts and Crafts, early 20th century fountain. Supplied with a 12.5cm (½in) copper pipe, but can be specially modified to take a larger pipe. The Sunfish (K052) was the original companion figure to this, presumably to go either end of a pool. A copy from a well-sculptured, antique lead cast, typical of the decorative Rococo Italian style, of the mid-18th century. Adaptation of a 19th century fountain from the Geiss foundry. Very large. Suitable for poolside use or as a centrepiece. Good sized, formal, 19th century tiered fountain. This style of dish is a magnet to wild birds. 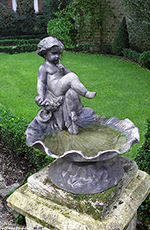 Based on a 19th century Val d’Osne putto and coupled with a 38cm (15in) scalloped shell. The water wells up from under the boy to form a cascade, adjustable to your needs. It is fixed to the wall by a hidden, attached 12.5cm (½in) copper dowel for ease of mounting. Taken from an antique 19th century Viennese drinking fountain. A very bold fountain of good, broad scale, with four finely-detailed, Venetian Rococo dolphins. The 1m shell provides an impressive cascade of falling water. Can be used in conjunction with many of our other fountains which then provide an upper tier, K29 Pike Boy for example. Fountain spout, suitable for a wall or as a centrepiece, in a formal, 18th-century style. This makes for an understated feature. Copied from an antique 19th century water feature. Suited to a small pool. First produced here at H. Crowthers in the 1930s. Created here at our Studio in 1908. This was inspired by the sturgeon that is depicted on the memorial to Henry Fawcett that stands in the Victoria Embankment Gardens, London. A simple but elegant fountian.